APEX, N.C. (WTVD) -- Lori Nash started her own cleaning business 21 years ago. But, the time spent doing hard, physical labor eventually caught up with her. "I was really starting to get a lot of tendonitis issues in my neck, shoulders and arms to the point where it was getting debilitating," she explained. "The best way I can describe it is those balsa wood airplanes where you take the propeller and the rubber band, twist, twist, twists, and then you fly? It's like every motion I did the tendons just started twisting, twisting and twisting. So by the end of the day it's like the band at the base of my skull was like a rubber band just twisted so tight [that] it starts to cut off the oxygen to my brain, and so then I was starting to have some vertigo issues." A friend recommended she visit Dunn Physical Therapy in Apex, and that's where she met Clinical Manager Rhoger Villalon. After doing an initial assessment and prescribing some of the more "traditional" treatments such as exercises and massage, he then recommended something else, a technique called dry-needling. "It's a treatment to allow us to release that muscle and allow that muscle to move in that right direction," says Villalon. 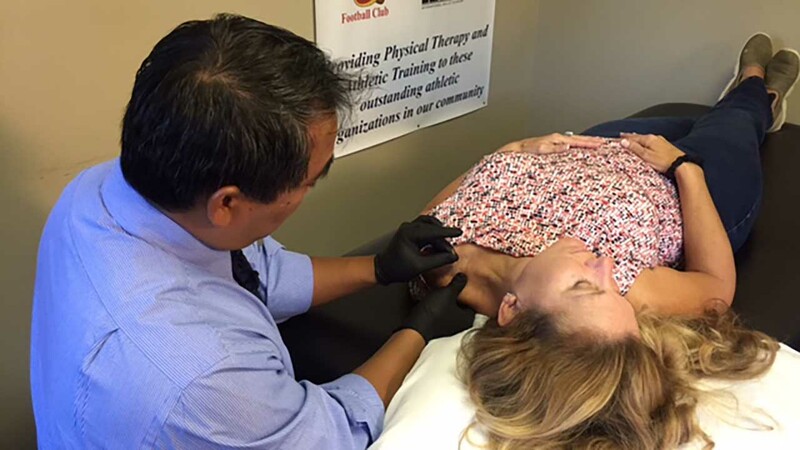 The process is explained further on their website, "Trigger Point Dry Needling (TDN) is the insertion of a small gauge needle into "trigger points" on the body to directly treat the neuromuscular system. It causes favorable biochemical changes that help the body manage acute and chronic pain, as well as muscle dysfunction." The needle itself is very thin, similar to what you might expect to see used in acupuncture, although Villalon cautions they're not the same thing. "It's very specific to a trigger point, so even if therapists are putting in multiple needles it's usually focused on that trigger point, and we're not doing meridians or the patterns of pain." Villalon says "trigger points," are often described as irritable, hard "knots" within a muscle that can cause pain and make it difficult to perform everyday tasks. "We find that trigger point, we find that central point of that needle, and we put that needle right into that trigger point, that center point of that needle, to get that muscle to kind of calm down," he elaborates. Villalon says different therapists sometimes use different techniques, but the one he most prefers involves employing a pistoning motion with the needle until he gets what he describes as a "muscle twitch," which is the muscle tensing up before finally releasing. According to Nash, that's the only painful part of the whole process, although for her it's a brief pain similar to a bee sting, that quickly subsides. "I don't feel the initial needle going into my skin, I don't feel that at all. I only feel it when he gets to a point in the muscle where it is really bound up," she explains. Villalon cautions that the area can be sore both during and after the procedure for 2-3 days, and you can see some bruising. But with that comes much-needed relief for patients such as Nash. "My pain level is zero, it's zero," she emphatically states. As for why it works, Villalon admits the medical community still isn't sure exactly. But, it's being researched. And, while data is being collected, he says his patients' results speak for themselves, as can be measured with before and after mobility tests. However, this practice isn't without controversy. Currently The North Carolina Acupuncture Licensing Board (NCALB) has filed a complaint pending in North Carolina Courts claiming that dry needling constitutes the practice of acupuncture, but those who are practicing it have not been properly trained per their standards. "For instance, acupuncturists receive over 3000 hours of training as opposed to 53 hours for Physical Therapists," says media relations spokesperson Joyce Fitzpatrick . "The use of 5 inch needles is a very serious matter. We are aware of serious injuries that have occurred because of this lack of training." Fitzpatrick goes on to clarify that this is the crux of the NCALB's lawsuit. "We insist that if the PTs want to practice acupuncture that is fine with us, but they must receive the appropriate training." But the Physical Therapy Board is standing firm behind the assertion that this practice differs from acupuncture. "Dry needling differs from acupuncture in important ways," says attorney Matt Sawchak on behalf of the Physical Therapy Board. "North Carolina defines acupuncture as 'a form of health care developed from traditional and modern Chinese medical concepts.' Dry needling was not developed from Chinese medical concepts. Also, dry needling does not use the same diagnostic techniques that acupuncturists use. These and other differences show that dry needling is physical therapy, not acupuncture." For more on a recent report on dry needling submitted by the NC Physical Therapy Board, click here.